The Orange River is the longest river in South Africa and the Orange River Basin extends extensively into Namibia and Botswana to the north. The river is also one of the longest rivers south of the Tropic of Capricorn. There are now three main storage reservoirs on the Orange River, namely Gariep Dam and Vanderkloof Dam on the Orange River inside South Africa and the recently completed Katse dam in Lesotho on the Senqu River. The Gariep Dam forms the largest reservoir in South Africa with a capacity in excess of 5 000 million m3 while Vanderkloof Dam forms the second largest reservoir with a storage of over 3 200 million m3. Although the storage of the Katse reservoir is lower at a modest 1 950 million m3, it is the highest dam in the Southern Hemisphere with a height of approximately 185 m above foundation. The 2420-kilometre-long Orange River, also known as the Gariep, begins as the Senqu River at an altitude of 3 000 metres in the Maluti mountains of the Lesotho Highlands. The River basin is the largest river basin in South Africa with a total catchment area in the order of 973 000 km². The river forms part of the international borders between South Africa and Namibia and between South Africa and Lesotho, as well as several provincial borders within South Africa. Except for Upington. It does not pass through any major cities. The river plays an important role in the South African economy by providing water for irrigation, as well as hydroelectric power. The river was named by Robert Jacob Gordon after the Dutch Royal House. Kanoneiland. Kanoneiland (or “Cannon Island”) is the largest island in the river and the largest inhabited island in South Africa. The Gariep Dam on the River is the largest dam in South Africa, and was a key part of the Orange River Project. The Gariep Dam (formerly known as the Hendrik Verwoerd Dam) forms the largest storage reservoir on South Africa with a total storage of approximately 5 500 million m3 and a surface area of more than 370 km2 when full. The dam is the central structure of the original Orange River Project which involves the supply of water to parts of the Vaal, Fish and Sundays catchments as well as to irrigation along the Orange river itself. Welbedacht Dam: The Welbedacht Dam is a concrete barrage-type dam on the Caledon River which was designed and constructed by the Department of Water Affairs. The dam has a catchment area of some 15 245 km2 with a natural MAR of approximately 1210 million m3/a (1920 to 1987) and was completed in 1973. Its purpose was to supply water to the city of Bloemfontein via the 115 km long Caledon-Bloemfontein pipeline which has a capacity of ~1.157 m3/s. Due to the high sediment concentration in the water, the transfer from Welbedacht Dam is first purified at the Welbedacht Purification Plant which is located just downstream of the Dam. The purification plant has a capacity of 1.68 m3/s. Augrabies Falls: Waterfall in the Orange River, 40 km north-west of Kakamas, 88 km west of Upington. From Khoekhoen (Korana), probably ‘hollow place’. Formerly the names King George’s Cataract and Hercules Falls were given but did not survive. The Afrikaans form Augrabieswaterval has been approved. Twin Falls: Twin Falls is next to Tierhokeiland and is located in Northern Cape, South Africa. Hartbees River. Tributary of the Orange River, joining it below the Augrabies Falls. The upper course is the Sak River. The name refers to the hartebeest (Alcelaphus sp.) and is a translation of Khoekhoen Kammaghaap. Fish River. Tributary of the Orange River. It rises in various headwaters north-west of Mariental and flows south-east and then mainly south to enter the Orange at Rooilepel, some 40 km south-west of Ai-Ais. The name, also encountered as Afrikaans Visrivier, is translated from Nama //Aub or //Oub, ‘fish’. The Fish River Canyon, reminiscent of the Grand Canyon in Arizona, is a popular tourist attraction. Makhaleng. Tributary of the Orange River. It rises in the mountains about 50 km east of Maseru and flows south-west to its confluence with the Kolo-La Pere north-east of Magalengbrug. Also encountered as Makaling and Magaleng, the name is said to be derived from Sotho lekhada, ‘aloe’; thus ‘at the aloes’. Melikane. Tributary of the Orange River. It rises at Lekhalo-La-Lethiba about 5 km south-west of Matabeng Pass and flows south-west to enter the Orange at Liqalabeng. Named after a San chief who had stolen cattle from the Basotho and was captured at this river. Molopo River. Tributary of the Orange River. It rises in head-streams originating in the Lichtenburg and Marico districts; flows west for 800 km to its confluence with the Nossob, then south for 90 km to lose itself in the sand near Abiquas Puts, and then to reappear near the Orange River. The name means ‘river’. The form Moloporivier is preferred for official purposes. Qhoasing. Tributary of the Orange River. It rises in the vicinity of Pedlar’s Peak and Thaba Lethu, some 50 km east-southeast of Mafeteng, and flows south-east to enter the Orange at Phokola, 40 km east of Mohale’s Hoek. The name is said to be a Sotho adaptation of the San word ! kh wa, ‘water’. Sak River. Upper portion of the Hartbees, tributary of the Orange River. It rises about 13 km north-west of Beaufort West and flows north-east, past Williston, Fraserburg and Brandvlei, to join the Hartbees south of Kenhardt. Afrikaans for ‘sinking (river)’, because it disappears into its sandy bed, the name is translated from Khoekhoen Haukaap. The form Sakrivier is preferred for official purposes. Samoep River. 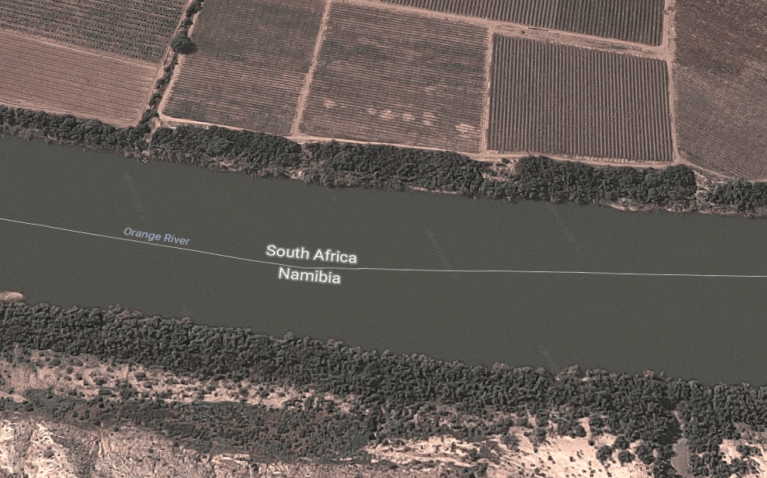 Non-perennial tributary of the Orange River. It rises south and south-east of Skuitklipkop and extends north-west to join the Orange near Steyerskraal, 20 km northeast of Onseepkans. The name is derived from Khoekhoen and probably means ‘San (Bushman) fountain’. Seekoei River. Tributary of the Orange River, rising in three headwaters, namely near Richmond, and in the Kompasberg, and flowing northwards to its confluence with the main stream 50 km north of Colesberg. Afrikaans for ‘hippopotamus (river)’, it previously bore the name Plettenbergs River, given by Colonel R J Gordon. Vaal River. Tributary of the Orange River. It rises near Klipstapel in the vicinity of Breyten and Lake Chrissie, and flows 1 355 km south-westwards to join the Orange some 13 km west of Douglas. Afrikaans for ‘grey river’, referring to the muddy colour of the water, the name is translated from Khoekhoen Heigariep. Aliwal North. Town on the banks of the Orange River, some 195 km from Bloemfontein, on the road to East London. It was founded in 1849 and named by the Governor of the Cape Colony, Sir Harry Smith (1847-1852), to commemorate his decisive victory over the Sikhs under Runjeet Singh at Aliwal in India on 28 January 1846. Municipal status was achieved in 1882. Kakamas. Town on the Orange River, 80 km southwest of Upington and 40 km west of Keimoes. It grew from an irrigation settlement established in 1898 for farmers left destitute by the severe drought of 1895-97 and the rinderpest epidemic of 1897. It was laid out in 1931, came under a village management board in 1948 and attained full municipal status in 1964. Of Khoekhoen origin, the name has been explained in a number of ways, the most acceptable being ‘place of drinking (water by stock)’. Gave its name to the finest yellow clingstone peach. Prieska. Town on the southern bank of the Orange River, 130 km north-west of Britstown and 75 km south-east of Marydale. It developed from a place to which farmers migrated when the pans were full, after rains. It was administered by a village management board from 1882 and attained municipal status in 1892. The name is derived from Korana and means ‘place of the lost she-goat’. Upington. Principal town of the Gordonia district, on the north bank of the Orange River, 32 km north-east of Keimoes and 194 km south-east of Olifantshoek. It developed from the mission station Olijvenhoutsdrift founded in 1871, and became a municipality in 1898. At first known as Olijvenhoutsdrift, it was renamed in 1884 after Sir Thomas Upington (1844-1898), Prime Minister of the Cape Colony from 1884 to 1886, who visited it in 1884. The Khoekhoen name of Upington is Kharaes. Neuseiland. Island in the Orange River about 10 km east of Kakamas and 25 km west of Neilersdrif. Afrikaans for ‘nose island’, the name is a partial translation of Khoekhoen Gariepeis, ‘river nose’. Neusberg, Neusspruit, Neushek and Neuspoort will have the same Khoekhoen origin. It would seem that the primary name is Koekoeb, ‘nose mountain’, from which Neusberg is translated. Kanoneiland. Kanoneiland (or “Cannon Island”) is the largest island in the Orange River and the largest inhabited island in South Africa. Island 14 km long and 3 km wide in the Orange River, 32 km south-west of Upington, site of an intensive irrigation scheme started about 1940. Afrikaans for ‘cannon island’, the name is partly translated from Khoekhoen Keboes, an onomatopoeic rendering of a cannonshot, said to have originated about 1878 in punitive expeditions against Korana freebooters. It rises in the Drakensberg mountains in Lesotho, flowing westwards through South Africa to the Atlantic Ocean. After rising in the Lesotho Highlands, less than 125 miles (200 kilometres) from the Indian Ocean, the river flows to the Atlantic Ocean in a generally westerly direction for some 1,300 miles. The river travels across the veld region of South Africa, after which it defines the southern limit of the Kalahari and divides the southern Namib desert before draining into the Atlantic at Alexander Bay. Along its course the river forms the eastern boundary of the South African province of Free State, as well as the boundary between Namibia and South Africa. The Orange empties into the Atlantic Ocean between the small towns of Oranjemund (meaning “Orange mouth”) in Namibia and Alexander Bay in South Africa, about equidistant between Walvis Bay and Cape Town. A River Rafting trip on the Orange River is all about getting back to nature. The Orange River Gorge is the most spectacular and easily navigated white water rafting section when you go Orange River rafting. The water is warm and the weather naturally perfect ‘all year round. Nothing beast a trip down the Orange River on a rafting Adventure: explore your limits. Situated in the northern parts of the Northern Cape Province of South Africa, Orange River Cellars offers an extensive range of dry white wine, natural sweet and dry red wine, as well as dessert wines. These wines are successfully marketed locally and internationally and enjoyed by wine lovers and cognoscenti alike. Float, paddle, drift, raft and navigate the Orange River, through the arid and strikingly beautiful Richtersveld. Blue skies, warm weather and lapping water make for an allround spectacular outdoor experience for the whole family. On the Richtersveld section, experienced tour operators such as Wildthing Adventures, Bushwacked and Felix Unite provide experienced guides to help you navigate your way downstream, over the long stretches of flat water punctuated by the odd rapids, on these 4-day trips. Sleep under the starlit African sky with raging campfires, good food and great company. Further up river, near Pofadder, Gravity Adventures offers exciting trips on the pristine and uncrowded Orange Gorge and Raap en Skraap sections, whilst just below the Augrabies Falls, adventure operator Khamkirri will guide you through the rapids on inflatable crocs (rafts) on anything from half day to 5 day trips. The Orange River mudfish is the most widespread fish species. The Gariep Dam, the largest dam on the Orange River and in the RSA, has a capacity of 5341 million cubic metres.